1) You can’t take a night off in the A-10. Saturday was a brutal night for home teams in A-10 conference games. Four of six home teams lost, one being an obvious mismatch (VCU v Duquesne), the other three relative stunners. Getting the mismatch out of the way, VCU (16-3, 4-) rolled Duquesne (7-10, 0-4), outscoring the Dukes 44-18 in the first half before dumping their bench in the 90-63 win, the Rams’ 13th straight. The Rams got dominating performances from usual suspect Treveon Graham and Juvonte Reddic, and a huge night (22 points in 25 minutes) from a dangerous Rob Brandenberg. VCU used 19 forced turnovers and a 15 rebound advantage to attempt 20 more shots than the Dukes in the win. I think the result that sticks out the most is what Dan Hurley’s squad was able to pull off at St. Louis. Rhode Island (6-10, 1-2) picked up just their sixth win of the season, upsetting the St. Louis Billikens (12-5, 1-2) 82-80, scoring 17 points in overtime to send SLU to 1-2 in A-10 play. SLU’s Kwamain Mitchell had his first big game since returning from injury, posting 29 points, seven assists and six steals in his 43 minutes on the floor. What’s absolutely stunning is the Billikens hit 53.8% of their 26 threes (43.8% from the field), turned Rhodie over 18 times…and lost. That’s because St. Louis was red hot, shooting 55% on the game and making 10-of-19 threes on the night. Huge road win for a Rhode Island team looking for some momentum. Next there’s the curious case of the Temple Owls. Temple has been one of the more hot and cold teams in the A-10, and this Saturday that came back to bite them against an experienced St. Bonaventure squad looking to get off the A-10 schneid. Temple got their usual big game from star Khalif Wyatt (31 points in 30 minutes), but when the Senior guard fouled out late, St. Bonaventure took the big play advantage, getting consecutive threes from Demitrius Conger and Chris Johnson to essentially ice the game. Like Rhode Island, the Bonnies couldn’t miss from deep, hitting 61% of their threes and shooting 49% as a team from the field. Lastly, George Washington (8-9, 2-2) dropped UMass (12-5, 2-2) in another tightly contested contest. The Colonials got 35 points off their bench in the 79-76 win. Charlotte has been one of the nice surprises of this season, heading into this game 15-2 with a 3-0 start to A-10 play. But many have questioned if up to this point the Niners were paper tigers, having played the weakest schedule of any Atlantic 10 team, the 210th ranked SOS heading into this weekend. The Spiders had no problems with Charlotte, defeating the Niners by 20 without leading rebounder and second-leading scorer Derrick Williams. The loss moves Charlotte to 1-3 against Kenpom top-100 teams, their lone win a 9-point home W against La Salle. Seven of the 49ers next nine games come against top-100 teams. Needless to say, we’ll know soon enough whether Charlotte’s hot start was due to masterful scheduling or a team who actually is vastly improved. 3) Is Butler guided by a higher, possibly evil, power? One of our favorite Atlantic 10 fan sites is Dayton Flyer blog BlackburnReview.com. The folks over at the BR have proposed this idea, and after the Bulldogs miraculous win over No.8 Gonzaga, we think they may just be on to something. Butler has been one of the hottest programs this past decade, dancing all the way to two national title games while providing some of the most amazing and exciting endings in years. The one time I’ve seen a Butler buzzer-beater not go there way? The 2010 national title game against the Duke Blue Devils. Coincidence? Either way, for our purposes it’s nice to have whatever power is guarding them on the side of the A-10. John Stockon’s son throws one of the worst passes we’ve ever seen and Roosevelt Jones makes him pay. Easily the best ending in years and a huge bump to Butler and the A-10’s RPIs. The Bulldogs will no doubt rise into the top 10 and are a legitimately fighting for a 1-2 seed in this year’s NCAA tournament. Scary news for the rest of the A-10? Bulldog leading scorer, Rotnei Clarke, was forced to sit this one out. Clarke returns for a tough three-game stretch that includes road games at La Salle and St. Louis with a home tilt against Temple in between. Roosevelt Jones (Butler) – Averaged 15 points, 8.5 rebounds and 4 assists and made the play of the year, stealing (catching?) 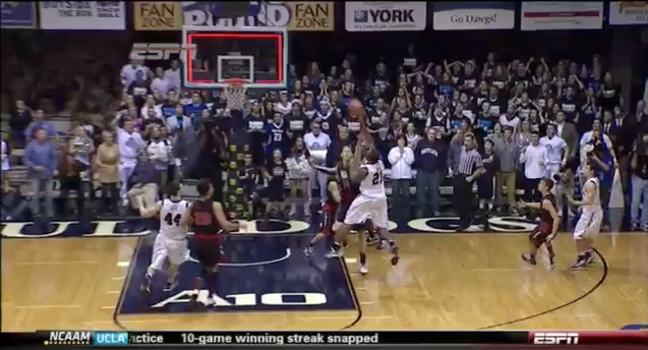 an inbound against Gonzaga and releasing the game-winning shot with .1 left on the clock. Treveon Graham (VCU) – Averaged 22.5 points and 5.5 rebounds and hit a clutch 4-point play in OT as VCU came back from certain death to defeat St. Joseph’s in Richmond. Semaj Christon (Xavier) – Averaged 18.5 points, 7.5 assists and hit the game-winning jumper with 5.1 to play to lift Xavier over St. Bonaventure in Olean. Khalif Wyatt (Temple) – Averaged 24.5 points including 31 in 30 minutes in a losing effort against St. Bonaventure.